Answer: I do not associate with non-Creators other than to be polite or to recruit. Life is a perpetual war being attacked from all sides. I am a realist. The RaHoWa is my life. The future Whiter and Brighter world is not for me, it is for the generations perhaps yet unborn … but I will never see it. Creativity to me is a brotherhood born in war. Only Total Victory can ease our burden. Aut Vincere Aut Mori! Answer: Once when you accept Creativity, you are on the point of no return. You can ignore the RaHoWa but it is here. I live in White society and it is destructive for ourselves because of ideologies which do not support the Advancement of the White Race. I have seen that many of my White People have become my enemy because they are devolving through backwards evolution. And when they see that you are continuing to evolve, you become their enemy because they see life through the eyes of the snake and you do not. I know that in future there will be only Creators as my friends because we do not need mugwumps. Marxist White families will be destroyed in the next generation, and many of them do not want to have children or are incapable to organize family. Liberals have big capital, but they expect that the mongrels will work for them, with the resulting policy being the same as the Whites have in South Africa. Christian families are conservative, but when you follow mongrel ideas, it means that the Christards will one day look like the early Christards: Poor, weak and all worse for wear. If you want Creativity to be successful, then read only White books and reject all non-White teachings. For example, if you read Adam Smith, do not become liberal because it is economy only for Whites created by White man. It is the same with all corporations and the entire world; if anything is the creation of White brain, it is for Whites Only. Answer: As nice and as eloquent your message is Brother, I think I’m more with the realism. Yes, in Creativity, we have a strong and positive message, but we first need to expose the Jewish agenda for what it is. No matter how many times we have to say it, we need White people to learn to recognize the threat when they see it. Because despite all the positivity in our religion, there’s a lot of negativity in our world that needs to be exposed first. Our families and folk may also be a bit difficult to recruit at times as well. My whole family (minus my father) is subscribed to the Judeo-Christian-Marxist agenda, and I only really had one friend in school (who thankfully is pro-White). I know there are some Alliance members and supporters who have practically lost all their family and friends when they joined our great racial religion, and I cannot imagine how hard and painful it must be when it happens. But the same problem arises with our families and folk as it does the world: there’s a lot of darkness and negativity in their minds. The darkness must first be banished before the light can come around. So yes, while we can focus on the positvity of our religion, we need to keep attacking the Jewish power structure until it falls apart. Because this isn’t just some do-good pastime for a religion. It’s a Racial Holy War to save and perpetuate our magnificent White Race. Answer: What is it that the US Army says? Lead, Follow or Get Out of the Way? Creators do not get out of the way. Creators Lead. Creators Follow. 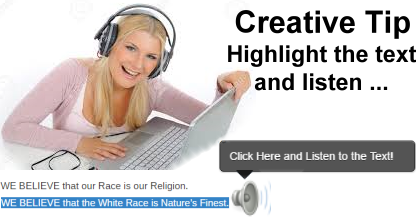 Creativity under the banner of the Creativity Alliance is a team united as a World-Wide Community dedicated to the Salvation of the White Race. Always remember that generations yet unborn expect that every Creator will do his duty. Together we will win this Racial Holy War.